There are two main features that define swords in the Aoe tradition. One such hallmark, present in this blade, is a forging pattern that later came to be known as namazu-hada ("catfish" steel), a rough and fine jinie steel mixed together so it appears as a spotted surface. The other is the straight tempering pattern, frequently with 'legs' (ashi) and later, sharply slanting 'legs' (saka ashi) with some small clove (choji) or irregular patterns (saka choji). 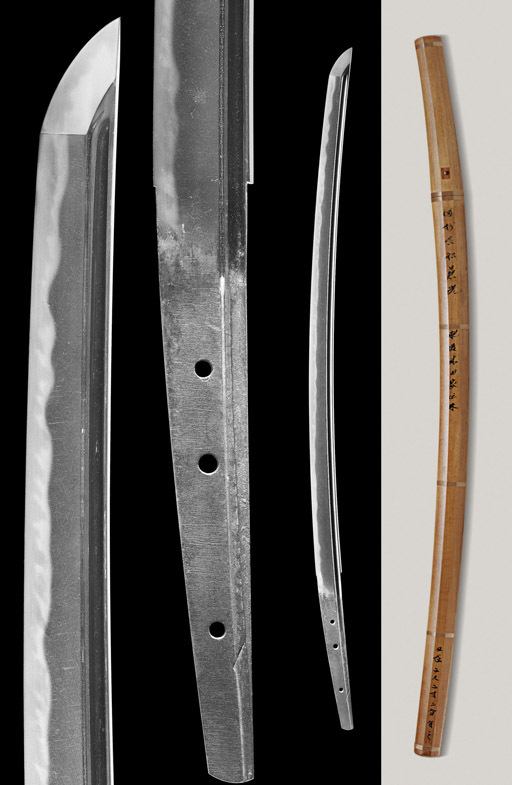 The gentle notare hamon mixed with the bright saka choji midare seen on this blade is typical of Nanbokucho-period Aoe blades.